Providing a home for yourself and your family is likely to be the single most important thing you will ever do. In doing so you are creating the very heart of your lifestyle and the base from which everything you do in life will begin. It therefore makes sense to ensure that whenever you come home, your house welcomes you with a feeling of warmth, comfort and security. What better and easier way to achieve such a “comfort zone” atmosphere than by fitting quality Double Glazing? 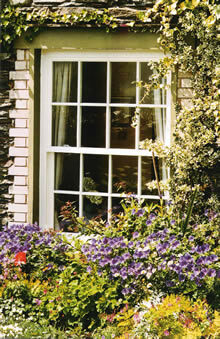 Old windows are often insecure, draughty and inefficient when it comes to keeping you safe and warm inside. Indeed many homes still feature their original style windows which simply would not be allowed to be fitted in these modern, energy conscious days. Our windows are constructed from state-of-the-art materials and are designed to meet all modern day requirements which include energy conservation, security and ease of use. Not forgetting - they look really good and blend in with the local environment too! What are the benefits of fitting Double Glazing? Fitting Double Glazing really doesn’t cost – It Pays! We use the same experience that helps customers choose replacement doors as we use in helping them choose their new windows, all guaranteed on double glazed units. For both doors and windows we use the very latest high-security locking systems. If you're looking for the latest styles in uPVC, steel, aluminium or even traditional wood you'll find we're able to supply them all. Perhaps you would feel more comfortable with a traditional style, such as a Victorian or country cottage look? Whatever your choice you can feel comfortable that all our work is guaranteed for 10 years. Whatever your vision for your home you'll find that we're able to help make it come true. We're able to offer the finishing touches to your new and old doors, windows or conservatories. Flat and decorative beading is as popular today as ever and you'll find that we are able to supply most variations and colours. Traditionally handcrafted stained glass, bevelled glass, and even etched glass is also available in a wide variety of styles.